While the elephants march across stage at the Republican National Convention in Ohio and fuel a media frenzy among Democratic donkeys, a humble mule plods up the mountains of Idaho and churns out a heartwarming news story. I come from the heartland of America. Minnesota is easy enough, but my highschool state is often overlooked and/or confused with others that have more vowels than outsiders can handle. The easiest association has always been agricultural. Iowa = corn, Idaho = potatoes. Ohio = where the river caught on fire and sparked a sputtering environmental movement. In this story Idaho’s taters stay invisible underground, while its spectacular mountain scenery rises as a backdrop for a tropical crop: coffee. Matt Bishop serves coffee brought into the Boise foothills on the back of his mule, in a true tribute to the way Colombian mules transport the coffee over mountains to be exported across the Americas. Don’t be fooled by all the fancy, unnecessary accent marks in Café Mulé. This is a humble operation. The mule, named simply Richard, is led by an earnest-faced young man in overalls and a straw hat. Matt Bishop dishes out cups of coffee to hikers, mountain bikers, and other nature enthusiasts who need recharging. And he doesn’t charge them a cent. Naturally, the Forest Service, when they caught wind of his generosity, booted him out of federal land for not paying for a permit. Logically, it’s an upfront to our capitalist society’s values, but ironically it was private landowners who offered Bishop stand space, a place to take a stand against greed and embrace slow-paced enjoyment of our national lands. Café Mulé continues to pour free coffee to hikers willing to go off the beaten path, wait for a freshly prepared cup, and perhaps give a tip for his passion. 1.) A reusable cone like the Brewologist stainless steel dripper that doesn’t require disposable paper filters. 2.) The hikers should follow the pack-it-in, pack-it-out philosophy and bring their own thermoses to not have disposable styrofoam cups. Happy trails to you, and may coffee make them all the merrier! 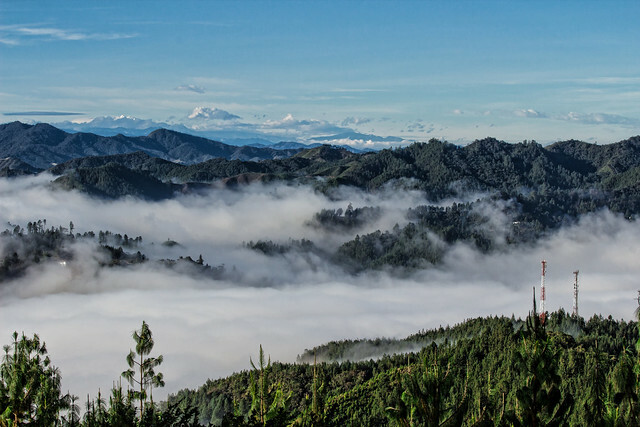 A month and a half ago, I got up before dawn and started a long drive out of the Medellín valley. We were enshrouded in a fog that clung to the cold mountains at three o’clock in the morning, a frighteningly solitary hour. I feared that up there, all alone, the car wouldn’t be able to bear the weight of our suitcases crammed with a ridiculous number of my dictionaries, enough coffee to last us at least three months, and all the basic tools to start a new life, minus the machete—not because it wasn’t essential, but due to oversize restrictions. We arrived at the airport intact, took a deep breath once all the luggage was checked in, and ordered some strong coffee at Pergamino. How else would we bid farewell to Colombia? In June 2016, with my Colombian husband and his shiny new immigrant visa, we began our next chapter of life in the United States. Sufficient reason to forgive the marked absence on this blog lately, I hope. We arrived smack in the middle of summer to the flat plains of Texas. We came from a tropical country that enjoys equatorial heat year round. We didn’t have a clue about what was in store for us. I’m from Minnesota, where summer is like a hiccup that comes unexpectedly between opening and shutting the freezer door. It’s so hot that I only drink coffee once a day, at six in the morning, when a cool breeze comes in and it’s only 84 Fahrenheit inside, which is the average high in Medellín. By 10 am it’s hit 92 degrees. Would you like a mid-morning coffee? No thanks. But I love the new place and how we’re transforming it into a home. I really want to plant some corn and beans in the backyard and grow a truly Colombian garden, or at least a replica of what we had in the beautiful village of Jardín (translates to Garden), Colombia. We are now in the city of Denton (sounds like “dentudo”=long-toothed), where folks like their food. Not so much the grass that toothy rabbits eat. More like cowboys with their steak. Unfortunately we could not feed any rabbits, or even goats, the tall sea of grass in the backyard. We sweat it out mowing manually (where is that darn machete now? ), fertilizing the soil along the way with our good intentions to cultivate the land. For now we have to wait until the heat of summer passes. Hace un mes y medio, me madrugué y prendí camino loma arriba. Pasamos por la neblina que abrazaba las montañas frías a las tres de la mañana, una hora espantosamente solitaria. Temí que allí, solitos, el carrito no aguantaría el peso de las maletas que cargaban una cantidad risible de mis diccionarios, suficiente café para por lo menos tres meses, y todas las herramientas básicas para arrancar una nueva vida, menos el machete—no por su inutilidad, sino sus sobredimensiones. Llegamos al aeropuerto intactos, respiramos profundo al pasar todas las maletas, y pedimos unos tintos en Pergamino. ¿Qué otra manera de despedirnos de Colombia? En Junio 2016, con mi esposo colombiano y su alucinante sello de visa de residencia, empezamos el siguiente capítulo de vida en los Estados Unidos. Razón suficiente para perdonar la marcada ausencia últimamente en ese blog, espero. Llegamos en pleno verano a los llanos planos de Texas. Venimos de un país tropical que goza del calor ecuatoriano todo el año. No tuvimos ni el menor idea que nos esperaba. Soy de Minnesota, donde el verano es como un hipo que llega inesperadamente entre el abrir y cerrar del congelador. Hace tanto calor que solo tomo café una vez al día, a las 6 de la mañana, cuando pasa una brisa fresca y todavía no alcanza los 84 grados Fahrenheit, o sea la temperatura máxima en Medellín. Para las 10 de la mañana ya marca 92 grados. ¿Tinto mediomañanero? No gracias. Pero me encanta el nuevo lugar y su transformación en hogar. Tengo unas ganas de sembrar maíz y frijoles en el patio trasero y cultivar mero jardín colombiano, una réplica de lo que tuvimos en el pueblo bellísimo de Jardín, Colombia. Ahora estamos en la ciudad de Denton, la gente de dientes grandes, donde nos gusta comer. No tanto como conejitos dentudos y su pasto, sino como caballeros con su bistec. Lastimosamente no pudimos alimentar ni conejo ni cabra con el océano de césped largo en el backyard. Sudamos la gota gorda cortándolo manualmente (¿dónde está el bendito machete ahora? ), fertilizando el suelo de paso con buenas intenciones de cultivar la tierra. Hay que esperar que pase el verano.